Every year we travel to Georgia to my mom’s house to celebrate Thanksgiving with my side of the family. It’s my mom’s favorite holiday, so when we first got married we decided that we would spend Thanksgiving with my family. I just love everything about Thanksgiving. In fact, I love everything leading up to Thanksgiving from bonfires, pumpkin patches, hay rides, cool fall mornings, hot chocolate and everything in between. If those aren’t enough reasons, two of my three babies were born two weeks before Thanksgiving, so we have much to be thankful for in our home.Since we are traveling, my mom does most of the cooking. As an amazing southern cook, it is simply her wheelhouse. The spread that my mom and aunt prepare is not for the faint of heart. There will be turkey, ham, dressing (not to be confused with stuffing), green beans, sweet potato casserole, lima beans, macaroni and cheese, collard greens, rolls, and so much more. Then, there are the desserts. Oh my word, ya’ll, my mouth is watering just thinking about the desserts: Homemade Coconut Cake, Banana Pudding, and German Chocolate Pecan Pie. 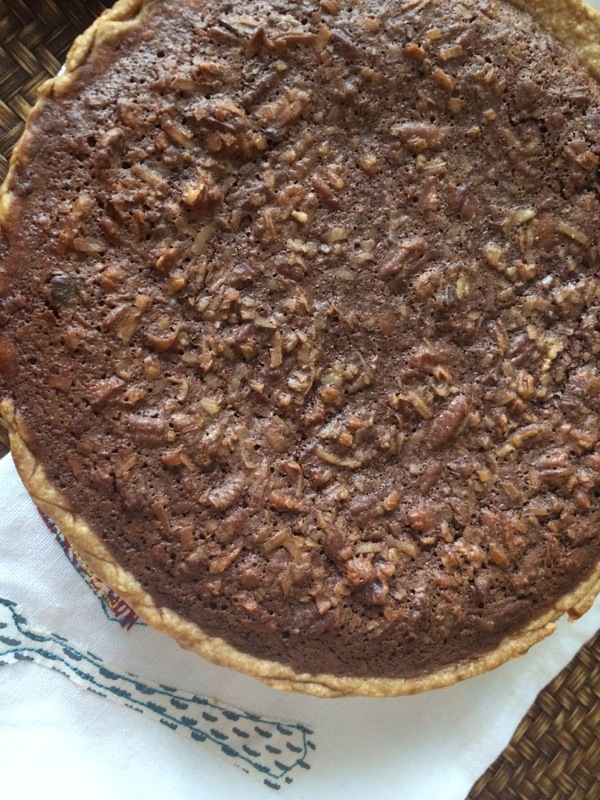 My mom has been making homemade German Chocolate Pecan Pie for forty years. It’s one of those desserts that tastes like you spent hours in the kitchen and is so delicious and decant that stopping at one piece is not easy. Everyone wants this recipe. Everyone! This past week, the kids and I took the recipe for a test drive to see if it was as easy as my mom says. First, we made a trip to ALDI to grab the ingredients we didn’t already have on hand. I love this time of year as ALDI’s Holiday offerings include a huge array of baking products to choose from which is perfect for all the Holiday baking we will be doing between now and the end of the year. We were able to grab all the ingredients we needed that we didn’t already have on hand and save money since ALDI’s prices are so much cheaper than other grocery stores. I love that I can save money at ALDI without having to use coupons. Preheat oven to 350 degrees. Mix sugar, salt, and cocoa together. Melt butter, then add to above ingredients. Next, add milk, eggs, and vanilla and beat on low to medium speed until combined. Stir in coconut and nuts. Pour into pie shells. Bake for 45-55 min or until middle is set. When the pies are no longer jiggly in the middle they are ready, since some ovens cook faster than others wait for the pie to set. 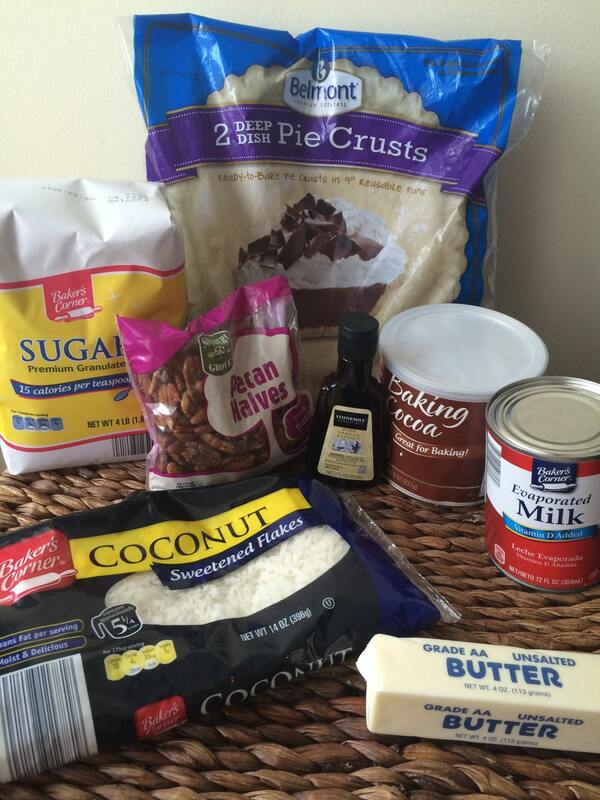 Note: This recipe can be prepared nut free. My daughter is allergic to all nuts except for pecans. However, she’s still afraid to eat them so we made one pie without the pecans and it set up perfectly! The pies were so easy to make. In fact, my kids made them with very little help. Besides the actual baking part, from start to finish it only took us about 10 minutes and an added bonus is that clean up was a snap! Save money while preparing for a crowd this Thanksgiving by shopping at ALDI. 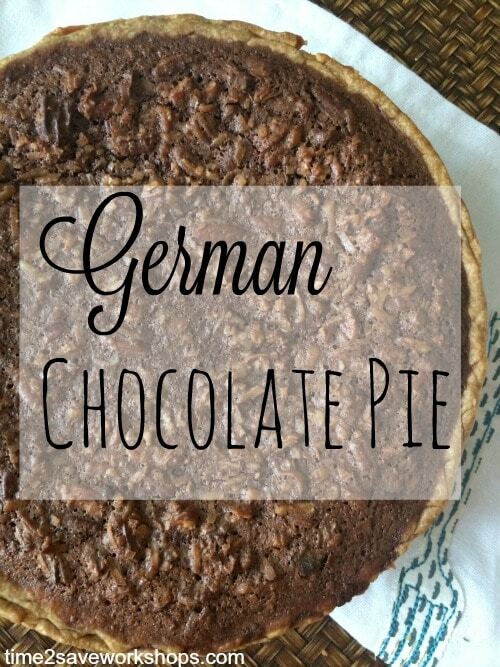 German Chocolate Pecan Pie (or German Chocolate Pie if you omit the pecans) makes the perfect dessert. Your friends and family will think you’ve spent hours in the kitchen slaving over this recipe. 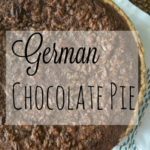 German Chocolate Pecan Pie (or German Chocolate Pie if you omit the pecans) makes the perfect dessert. Your friends and family will think you've spent hours in the kitchen slaving over this recipe. Melt butter, then add to above ingredients. Next, add milk, eggs, and vanilla and beat on low to medium speed until combined. Bake for 45-55 min or until middle is set. When the pies are no longer jiggly in the middle they are ready, since some ovens cook faster than others wait for pie to set. « Black Friday Starts on Amazon TONIGHT!